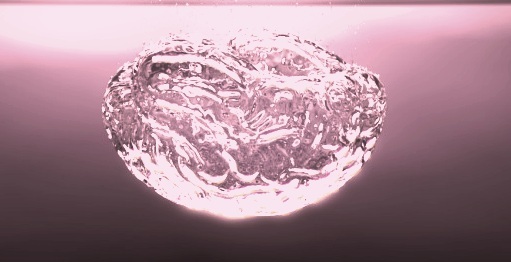 …and a brain development instrument…. 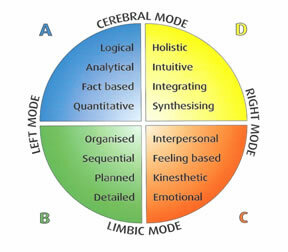 One wise participant in the group noted that most organisational management structures favour a blue or blue/green orientation (hierarchical: command and it will be done). Interestingly the facilitator noted that there were a relatively higher number of blue or blue/green orientations amongst western males and that western males still heavily “drove” the design of workplaces. She also suggested that, regardless of the authentic orientation of a person, the blue-green skew of workplaces tends to produce workplaces that replicate that reality. It was at this point that I rotated HBDI diagram on its A/C axis (see previous diagram) so that the quadrants were all in the same place relative to one another but the blue and green quadrants were at the top. And I began to realise that quadrants on the HBDI diagram (and what HBDI is trying to achieve in terms of bringing diversity into relationship) again reflect the ideas of the “U” path (diagram 8). 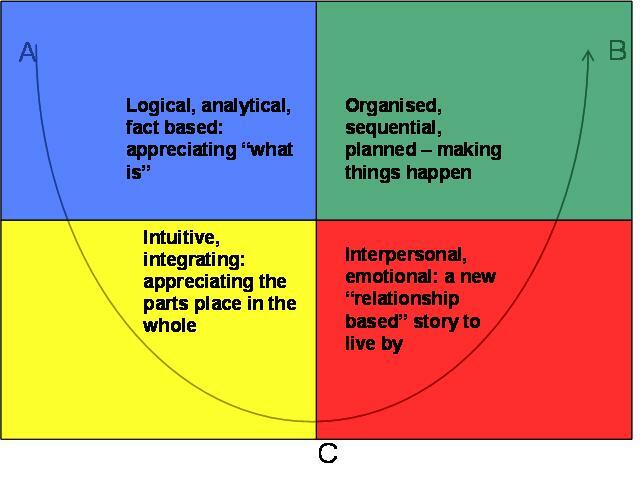 When we get a preponderance of blue-green thinking we get A to B type organisations and an A to B type of world….objectification, power over, hierarchy. Only when we can invite all of the colours (all of the diversity of the cosmos) into the conversation can we reap the reward of true creativity. It’s not about replacing blue-green with yellow-red. It’s about all of the colours being held together in any given situation. Perhaps ironically, an instrument invented to promote business performance reminds me of the poetry of St Paul relating to the “body of Christ” and “putting on the mind of Christ.” Such a body of people is one that always strives to ensure there is a rich mixture of HBDI colours acting together, and no one colour overpowers another. Similarly such a mind “turns around” from mechanical blue-green approaches to life, and acts always to ensure the different “true colours” of each individual can have a voice.